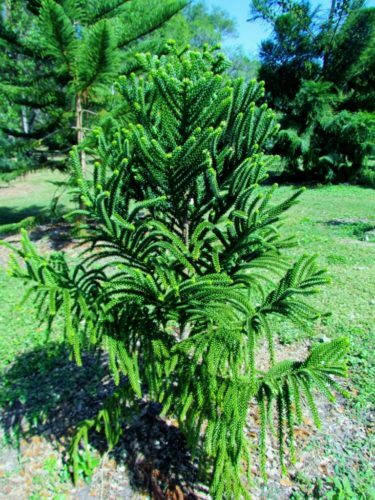 Araucaria laubenfelsii, first described in 1968 by Michel Corbasson (1927 - ), is commonly known as De Laubenfels' araucaria. It is named for David de Laubenfels, a world-renowned botanist who specialized in the flora of New Caledonia and the south Pacific. Description. De Laubenfels' araucaria is a columnar coniferous species of tree which will grow to a mature height of 35 to 150 feet (10-50 m) tall with branches that are dense and spreading. Its bark is gray, exfoliating in thin strips or irregular scales. Branchlets are somewhat twisted, 0.7 to 1.1 inches (18 - 28 mm) in diameter. Juvenile leaves are spreading, needle-like, non-flattened, with an incurved apex, 0.4 to 0.6 inch (10 - 15 mm) long. Adult leaves are scale-like, triangular, imbricate, with an acuminate apex and prominent incurved, midrib, 0.5 to 0.8 inch (1.2 - 2 cm) long by 0.3 to 0.4 inch (8 - 10 mm) wide. Pollen cones are cylindrical, curved, 4.8 to 6 inches (12 - 15 cm) long by 0.8 to 1.1 inches (22 - 28 mm) wide, with ovate scales, triangular microsporophylls, and 12 pollen sacs. Seed cones are globular, 4 to 5.2 inches (10 - 12 cm) long by 3.2 to 3.6 inches (8 - 9 cm) wide, with long erect bracts 0.3 to 0.4 inch (8 - 10 mm) long, recurved at the tips. Seed is up to 1.2 inches (3 cm) long, with rounded wings and a broad nut. Distribution. This species is native to southern New Caledonia — Mt. Mou, Mt. des Sources, Mt. Dzumac and Mt. Dou at elevations of 1,300 to 4,500 feet (400 - 1,400 m) above sea level. At Mont Do Botanical Reserve, this species receives an average rainfall of 66 inches (1690 mm) per year. A. laubenfelsii occurs on ultramafic soils in both maquis and as an emergent in upland rainforest. In both habitats is evidently regenerates more or less continuously in response to small-scale disturbances including fire (in maquis) and blowdown (in maquis and rainforest). Attribution from: Silba, J. ©1986. An international census of the Coniferae. Phytologia memoir no. 8. Corvallis, OR: H.N. Moldenke and A.L. Moldenke. Araucaria laubenfelsii — a young specimen at at Montgomery Botanical Center, Coral Gables Florida.